Virgin Galactic’s SpaceShipTwo successfully flew to suborbital space Dec. 13 with four NASA-supported technology payloads onboard. The rocket motor burned for 60 seconds, taking the piloted spacecraft and payloads beyond the mission’s 50-mile altitude target. A winged spacecraft will soon take off with four NASA-supported technology experiments onboard. Virgin Galactic’s SpaceShipTwo will separate from the WhiteKnightTwo twin-fuselage carrier aircraft and continue its rocket-powered test flight. NASA’s investment in the growing suborbital space industry and strong economy in low-Earth orbit allows the agency to focus on farther horizons. NASA will venture forward to the Moon – this time to stay, in a measured, sustainable fashion - in order to develop new opportunities and prepare for astronauts to explore Mars. The Flight Opportunities program is funded by NASA’s Space Technology Mission Directorate at the agency’s Headquarters in Washington and managed at NASA's Armstrong Flight Research Center in Edwards, California. NASA's Ames Research Center in California's Silicon Valley manages the solicitation and selection of technologies to be tested and demonstrated on commercial flight vehicles. The Vibration Isolation Platform from Controlled Dynamics Inc. has completed five successful Flight Opportunities-sponsored flights on suborbital reusable launch vehicles (sRLVs). The scheduled flight on SpaceShipTwo will mark its sixth. Video of the Physics of Regolith Impacts in Microgravity Experiment, or PRIME, to study the response of asteroidal or lunar regolith in reduced gravity conditions on parabolic airplane flights. 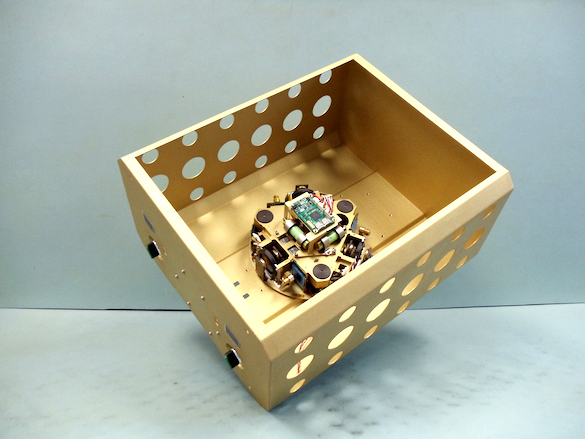 The Collisions Into Dust Experiment, or COLLIDE, studies the same phenomena but with longer duration and better quality microgravity on a suborbital flight. Data collected onboard Virgin Galactic’s SpaceShipTwo will help the experiment obtain data from slower impacts as well as study the behavior of the regolith and ejecta after the impact. 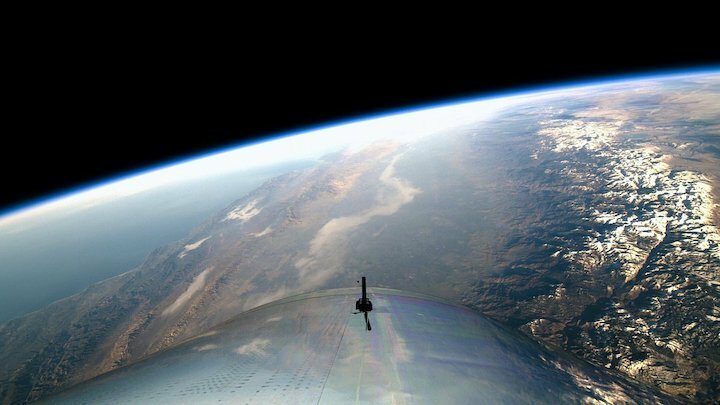 Rocketing high over California's Mojave Desert, Virgin Galactic on Thursday said it put humans into space from U.S. soil for the first time since the end of NASA's space shuttle program in 2011. 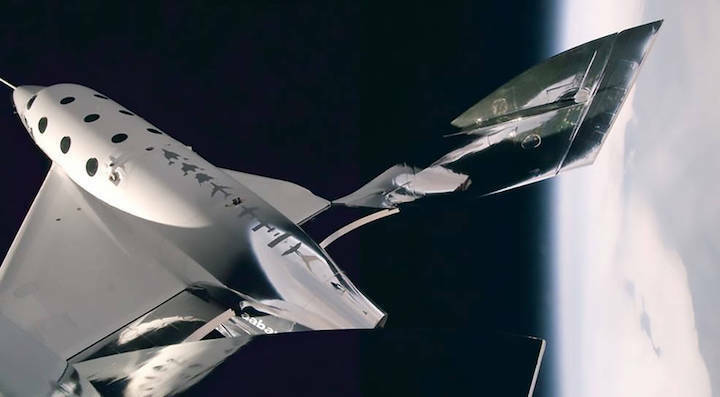 A pair of test pilots flew the company's SpaceShipTwo above 50 miles. That's the altitude at which NASA, the Air Force and now the Federal Aviation Administration award astronaut wings, though it is short of the Karman Line, the internationally recognized border of space at 62 miles. 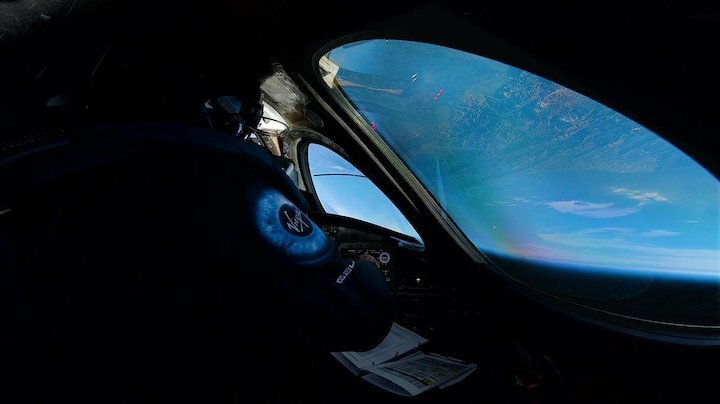 "SpaceShipTwo, welcome to space," the company said on Twitter. A pair of test pilots aboard Virgin Galactic's SpaceShipTwo "VSS Unity" flew above 50 miles over Mojave, California, during a powered test flight on Thursday, Dec. 13, 2018. The company called the successful test flight its first trip to space. The suborbital ride, which briefly made pilots Frederick "C.J." 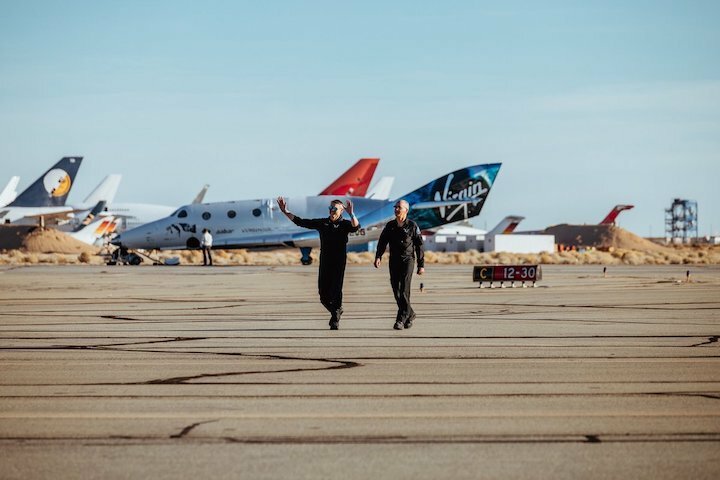 Sturckow and Mark "Forger" Stucky feel weightless, pushed the ship named VSS Unity to its highest speed and altitude yet on its fourth powered flight. 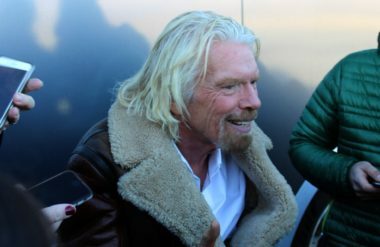 The successful test brought the company founded by Sir Richard Branson a step closer to starting a commercial spaceline operation flying wealthy passengers from Spaceport America in New Mexico. 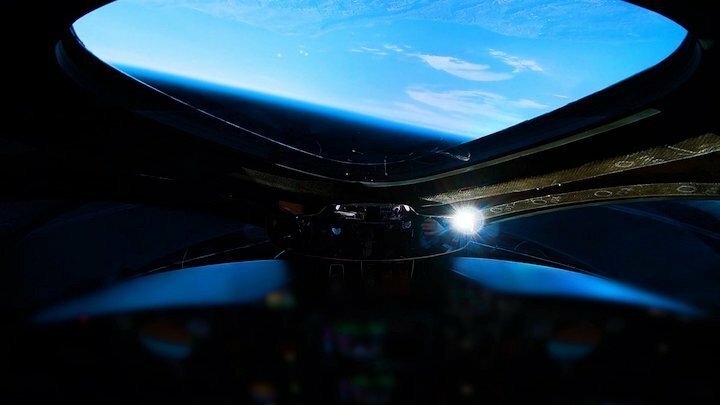 A view of Earth as seen from Virgin Galactic SpaceShipTwo "VSS Unity," which flew to an altitude of 51 miles -- above the boundary of space, by one definition -- during a test flight over Mojave, California on Thursday, Dec. 13, 2018. The long-awaited milestone came more than four years after a fatal test flight over Mojave that killed co-pilot Michael Alsbury, injured pilot Peter Siebold and destroyed the VSS Enterprise. The VSS Unity took off around 10 a.m. EST attached to the belly of the twin-fuselage WhiteKnightTwo carrier aircraft. The spaceship was dropped at about 43,000 feet. After free-falling for several seconds, a hybrid rocket motor fired and remained lit for 60 seconds, propelling the ship to Mach 2.9, or nearly three times the speed of sound. That topped the previous top speed of Mach 2.4. The test crew continued to climb after the engine cut out, coasting to a peak altitude of 271, 268 feet, or just over 51 miles. Sturckow, a former NASA astronaut who flew four shuttle missions, and Stucky commanded the ship's twin booms to rotate upward, or feather, as the spaceship dropped back to Earth, before locking them back into position for a runway landing. Virgin Galactic's SpaceShipTwo "VSS Unity" touched down in Mojave, California, to complete a successful test flight that the company called its first trip to space on Thursday, Dec. 13, 2018. In addition to the two pilots, SpaceShipTwo has seats for six passengers. Virgin Galactic has taken deposits for more than 600 tickets costing $250,000, but struggled to show it is ready to fly paying customers. On Thursday, the VSS Unity flew four microgravity experiments for NASA — including contributions from the University of Central Florida and University of Florida — that the company said helped to simulate the weight of future passengers. Branson has promised to be one of the first. SpaceShipTwo is a successor to SpaceShipOne, funded by the late Paul Allen, which in 2004 won the $10 million Ansari XPRIZE to become the first privately developed spacecraft to reach space, doing so twice within a week. Virgin Galactic is competing with Blue Origin, the space company backed by Amazon.com billionaire Jeff Bezos, to begin flying space tourists. Blue Origin has said it expects to fly people next year on New Shepard, an unpiloted capsule flown from the company's private launch range in West Texas. The company has not confirmed a ticket price. 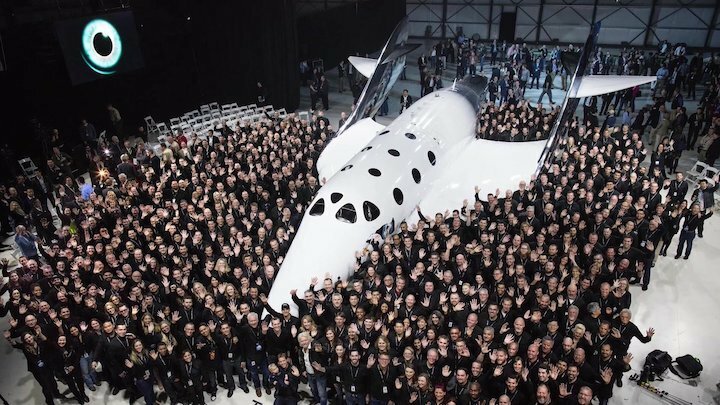 Virgin Galactic's SpaceShipTwo "VSS Unity," surrounded by employees from The Spaceship Company, which built the spacecraft. NASA next summer hopes to launch its own astronauts into orbit from U.S. soil for the first time since the shuttle's retirement. Boeing and SpaceX are preparing Starliner and Crew Dragon capsules, respectively, for test flights from Cape Canaveral to the International Space Station. SpaceX is targeting Jan. 17 for a first test flight of the Crew Dragon without a crew on board, with a pair of test pilots potentially boarding as soon as June. The Starliner could fly an uncrewed test as soon as March and astronauts by August. MOJAVE, Calif. — With a first flight to the edge of space under the company’s belt, Virgin Galactic founder Richard Branson believes commercial flights of SpaceShipTwo could begin some time next year. 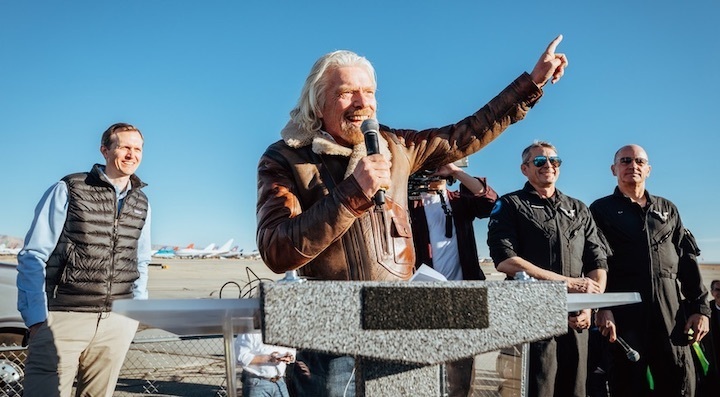 An exuberant Branson took the stage at the Mojave Air and Space Port here to congratulate the company and its employees for a successful test flight Dec. 13 of the SpaceShipTwo vehicle named VSS Unity, which reached a peak altitude of 82.7 kilometers. The flight was the first by the vehicle to cross the boundary of 50 miles, or approximately 80 kilometers, that U.S. government agencies use to award astronaut wings. This flight does not mark the end of the test flight program for SpaceShipTwo. “We will now push on with the remaining portion of our flight test program, which will see the rocket motor burn for longer, and VSS Unity fly still faster and higher,” he said onstage. On the Dec. 13 test flight, SpaceShipTwo’s hybrid rocket motor burned for 60 seconds, several seconds longer than the high end of estimates of the burn time company officials gave at a briefing the day before. George Whitesides, chief executive of Virgin Galactic, said after this flight that a full-duration burn would last approximately five seconds longer. Branson was optimistic that the next test flight could take place in the near future after a review of data from this flight. “If nothing shows up that needs to be changed, then the next test flight could be quite soon,” he told reporters, suggesting that could happen in roughly a month. 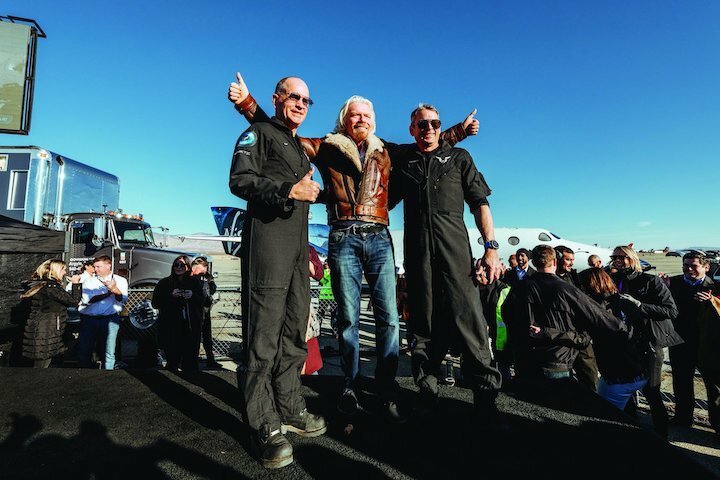 Branson confirmed that he still planned to be on the first commercial flight of SpaceShipTwo from Spaceport America. “Sometime next year, once the testing is finished, then I’ll do my flight,” he said. The company plans to grow the fleet of vehicles supporting commercial operations. Besides VSS Unity, two more SpaceShipTwo vehicles are currently under construction, with the first of them expected to be completed in about a year. Branson said the company would “soon” start building two more SpaceShipTwo vehicles as well as a second WhiteKnightTwo carrier aircraft. Virgin Galactic has about 700 customers who have either paid the full price of a ticket or a deposit. “We stopped for the last four years taking new reservations,” he said, but will start taking reservations again soon. Those new customers might be paying more than the $250,000 price previously offered by the company. “What will happen in the short term is that the price will go up a bit,” he said. “And then, in the next most likely three years, it will start coming down.” He didn’t specify the size of the increase or by how much the price would later decrease. “Space is not cheap,” he said. “I’ve personally invested about a billion dollars into this project.” He said that the total investment was about $1.3 to 1.5 billion, a total Whitesides said later included not just Virgin Galactic but also spacecraft manufacturer The Spaceship Company and small launch vehicle firm Virgin Orbit. Branson suggested that he may be looking for additional investors into the company. Virgin Group announced an agreement with the Public Investment Fund of Saudi Arabia in October 2017 that would have resulted in a $1 billion investment in Virgin’s space companies. However, Branson said in October that he had terminated the deal in reaction to the murder of journalist Jamal Khashoggi by the Saudi government.